We start our day pretty early to avoid a busy trek. The night was chilly but not too cold. The extra we were paying for the attached bathroom wasn’t worth it, it was just too cold – especially in the morning – so we didn’t use it at all. There was (supposedly) a hot shower in the shared bathroom area, which we didn’t use either. The ground was still frozen, and we had to walk in the shadow. The sun was already out, and the peaks were glowing in a warm orange color. Just after Phakding, we had to cross the river to reach the other side of the valley. It was the first real suspension bridge we had to cross. The trek was well traveled, so we continually came across locals, yak- and donkey trains, and of course a couple of other tourists. 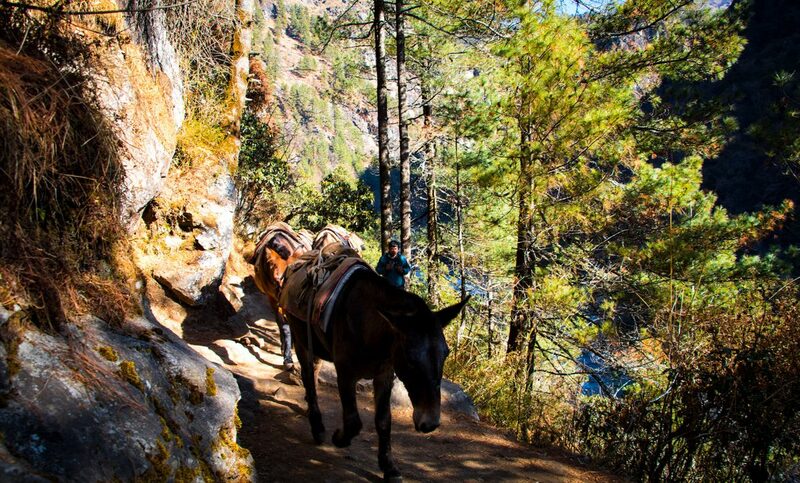 The sound of the donkey bells was a loyal companion throughout the hike to Namche. There are a lot of traditional huts and villages along the way, but also quite a few post-earthquake teahouses. You could see that everybody was preparing for this year’s trekking season. The next small village we reached was Tok Tok. There is a really lovely huge teahouse in this village, which looked inviting. Walking in the sun was way nicer, and we could take off the gloves and warm winter jackets that made you feel like a Michelin mascot. 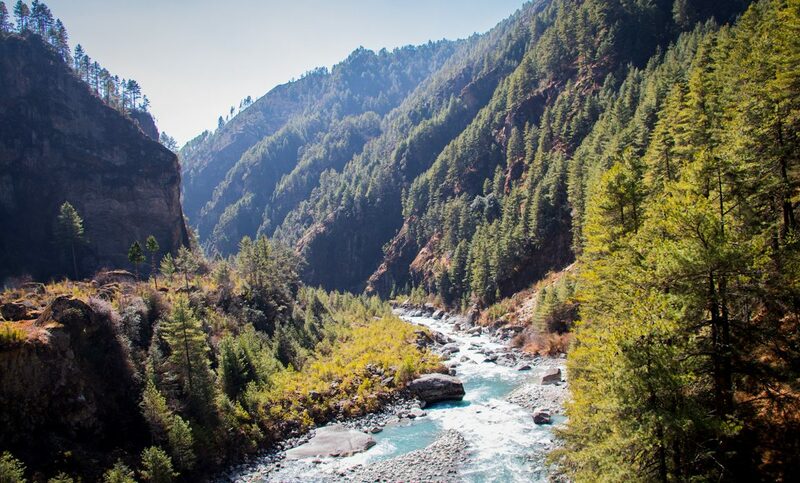 It was a constant climb up and down, with a beautiful view over the Dudh Kosi River. 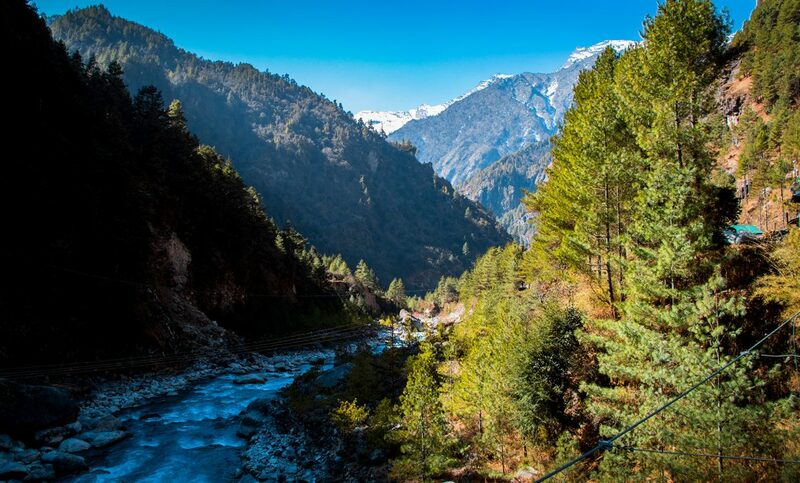 We made a couple of short breaks in the sun to enjoy the landscape of the trek. Just after Benkar, we had to cross the river once more. 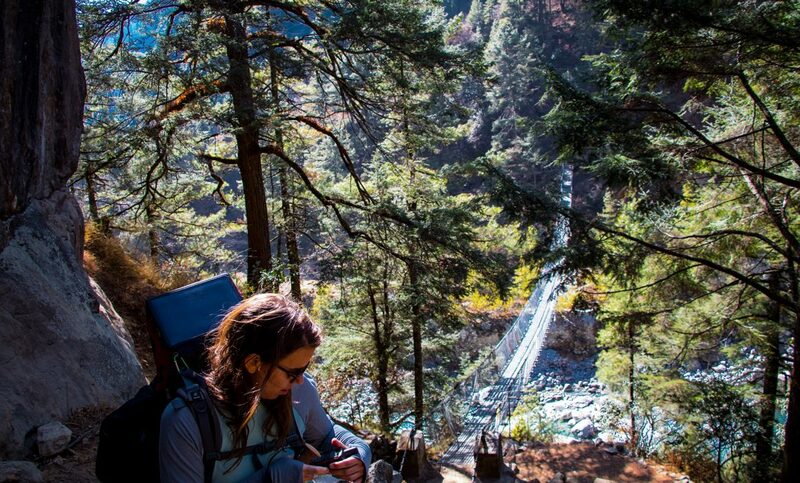 The suspension bridges are well serviced, but we always had the feeling that they could collapse in the next second. The sides of the bridges are decorated with praying flags. It was the clearest water and the highest river we have ever seen. A few other trekkers were overtaking us. They were smiling at us, with their light daypacks it seemed they were flying up the trek. It must feel so good to have just a few kilos on your shoulders. Instead, we both were carrying around a ridiculous 17 kg each – Bella even a little more, which made me feel bad. I couldn’t carry much more because I broke my shoulder three weeks before, on our last trip to the Seychelles. 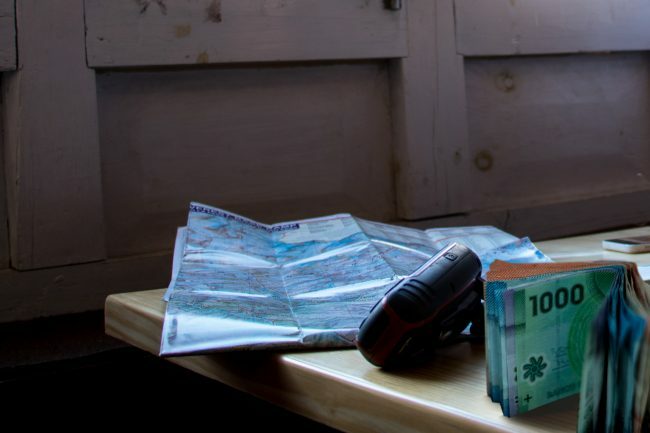 The day before we headed off to Nepal I got my bandage removed and told the doctor that I would be walking all the way up to Everest Base Camp. He was a little irritated. I tried to pack my backpack according to my injury, so I was carrying most of the stuff on my right shoulder and hip. Which worked out pretty good – but looked like I have no clue how to pack a backpack: way crooked. 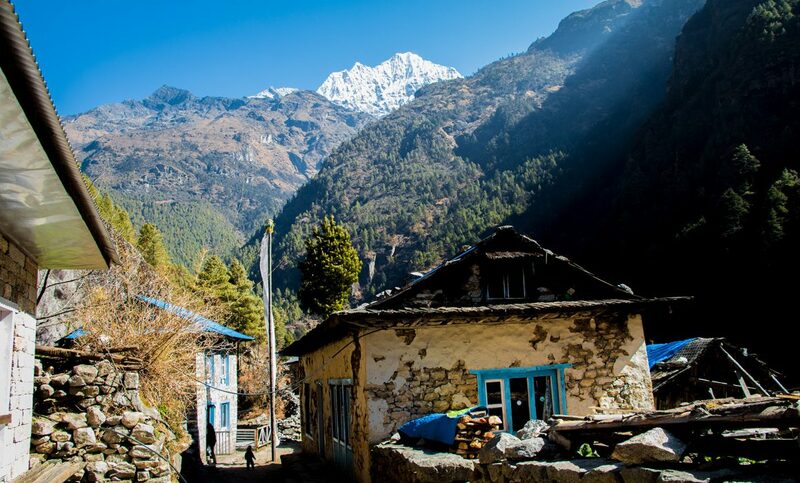 The next village we reached was Monjo, it also marks the entrance of the Sagarmatha National Park. 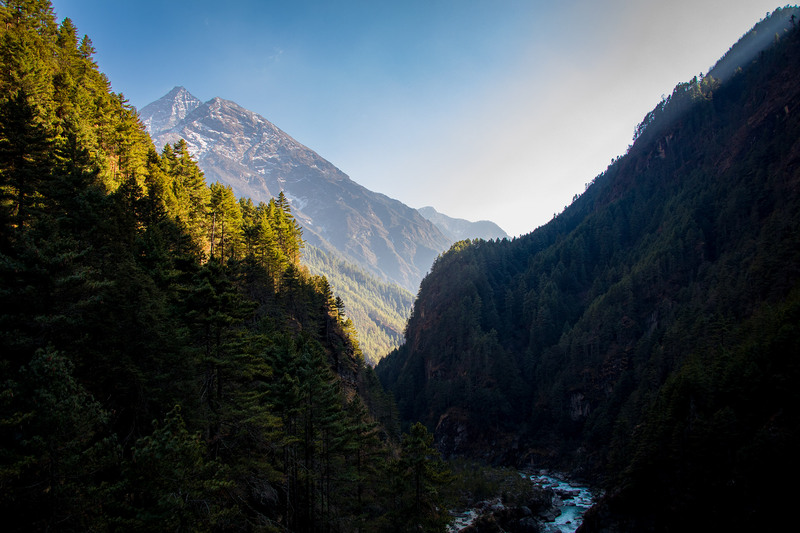 Sagarmatha is the Nepalese word for Mount Everest. Here we had to buy the TIMS (Trekkers’ Information Management Systems) card. Which costs 2000 NRs. per person. You can also buy the card at the TIMS Counter at the Tourist Service Center, in Bhrikutimandap, Kathmandu. We didn’t plan ahead, and the office was already closed… Office hours are from 10 am to 5 pm, 7 days a week. 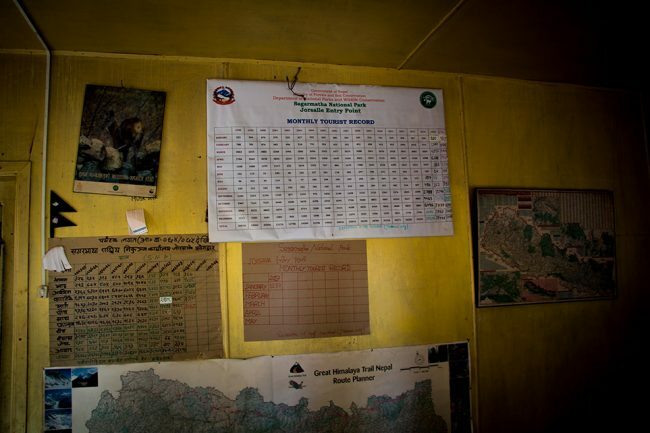 The card is mandatory and ensures safety for all trekkers in Nepal. In any case of emergency on the trek, the TIMS card will help you. You have to provide your health insurance details and will need a passport photo to buy the card. 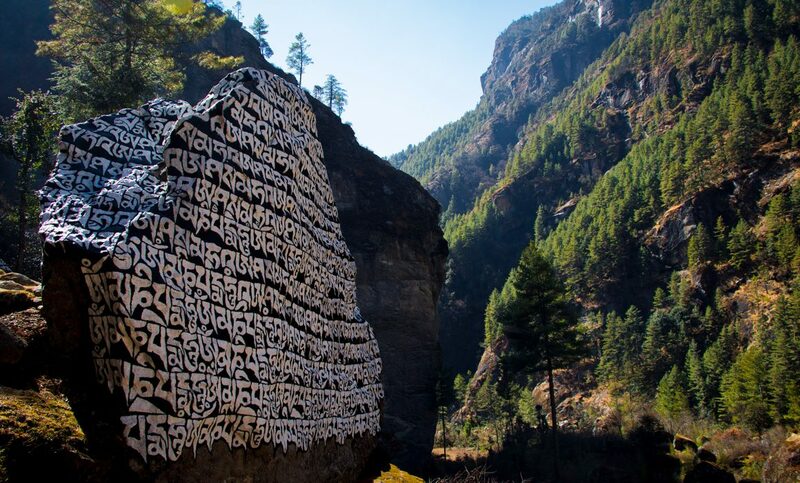 On our way to Namche – like on the hike to Phakding the day before – we saw countless numbers of helicopters flying towards Base Camp or back to Lukla or even Kathmandu. 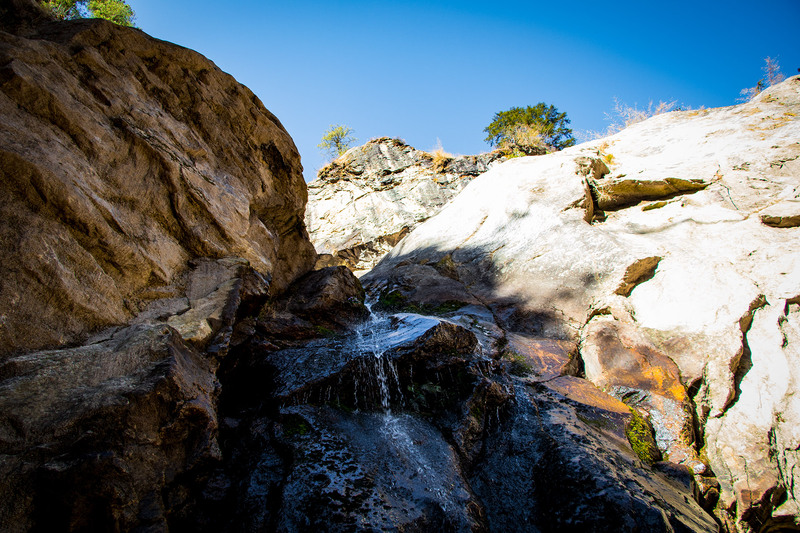 The helicopter sound is the only man-made sound you will hear on the whole trek, especially in lower altitudes. 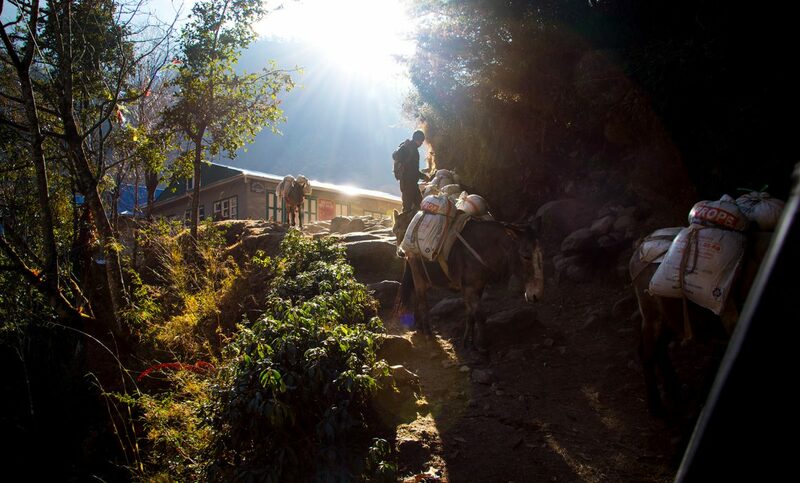 The helicopters have to bring trekkers – who are affected by AMS (mountain altitude sickness) – down to lower altitudes. At the entrance of the National Park, we had to show our TIMs cards and had to pay the National Park Entrance Fee, which is around 3400 Rupees. Behind the lovely guy at the gate was a huge wall with all the numbers of people attempting to trek to EBC each year. 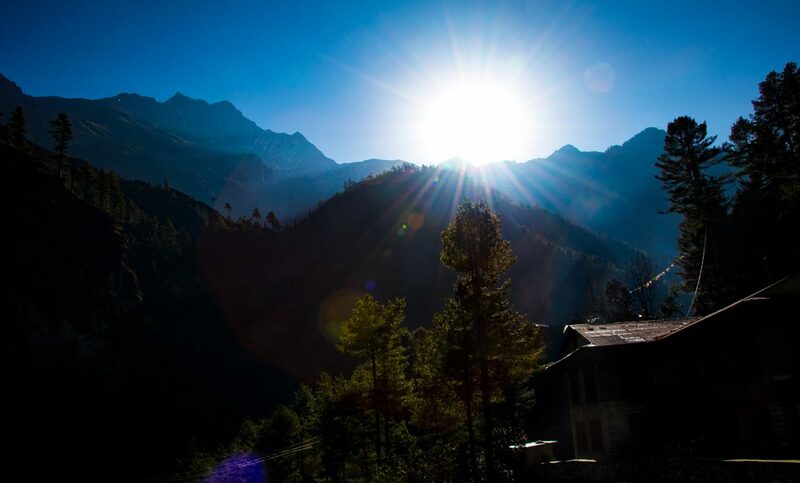 It was crazy to imagine that in high season there are up to 10.000 people a month in this region of the Himalayas. 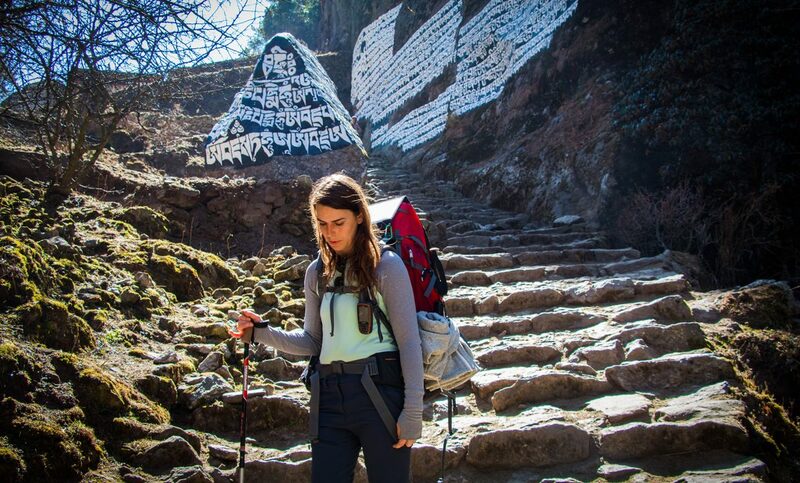 You could also see how the earthquakes affected the hiking industry in Nepal. 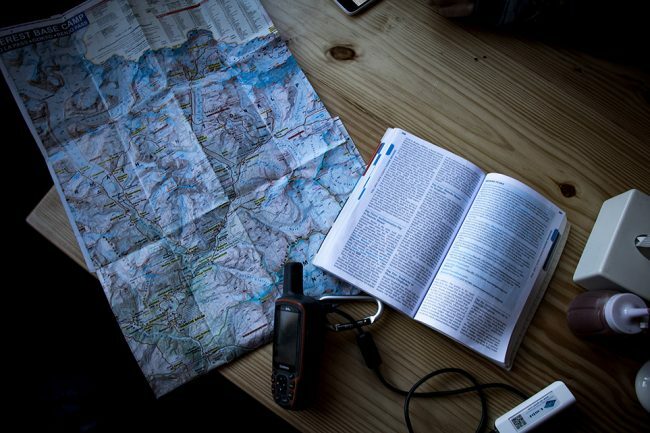 There were just 16 trekkers in the area around June 2015. But since then, the numbers are growing rapidly. The entrance felt a bit like entering Jurassic Park, we had to walk through a big gate and walk down to the bottom of the valley, where we had to cross the river again. 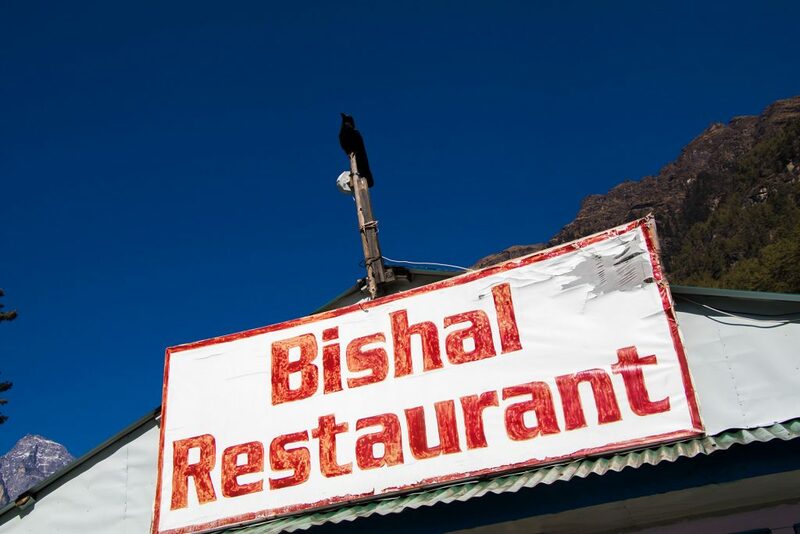 We had lunch at the Bishal restaurant. We had garlic soup, MoMos, and fried noodles. If you ate this amount of food at home, you would become fat just in a couple of days. 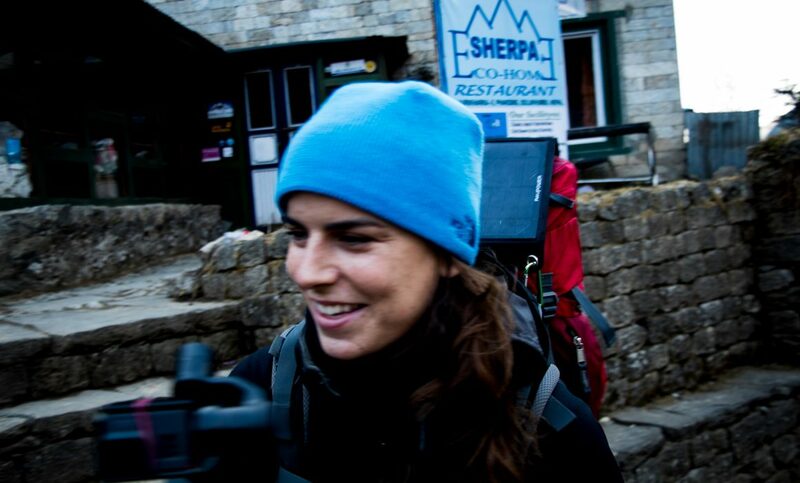 But here you need the energy for the “big jump” towards Namche. 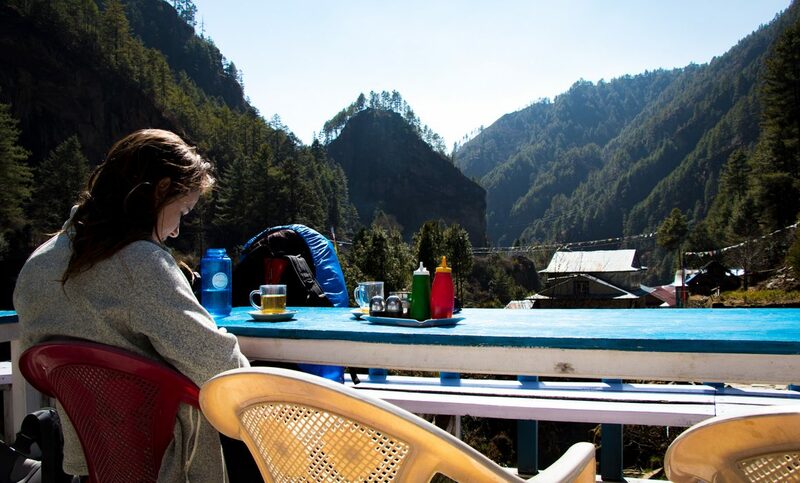 The restaurant was super charming, with wonderful views over the valley, the Dudh Kosi and the enclosed mountains. Right after the town comes another suspension bridge. From here on the trail becomes way steeper. A donkey train was just a couple of meters behind us. They were carrying gas bottles for the guesthouses in Namche Bazaar. The trail was great. We walked through a vast forest, which provided us with a nice mixture of shadow and sun. When there wasn’t any donkey poo on the trail, the smell of the warm but still fresh spring air was terrific. 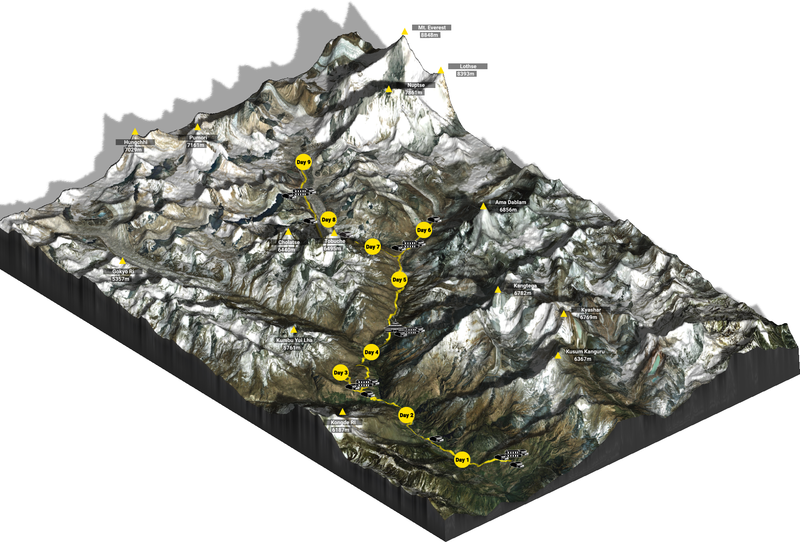 Our GPS device told us there will be a 200 m drop down just before we’ll have to climb up to Namche. But luckily it never came. Maybe they changed the path, we got lost a little, or the data is incorrect… we still don’t know. We had to cross the river one more time. 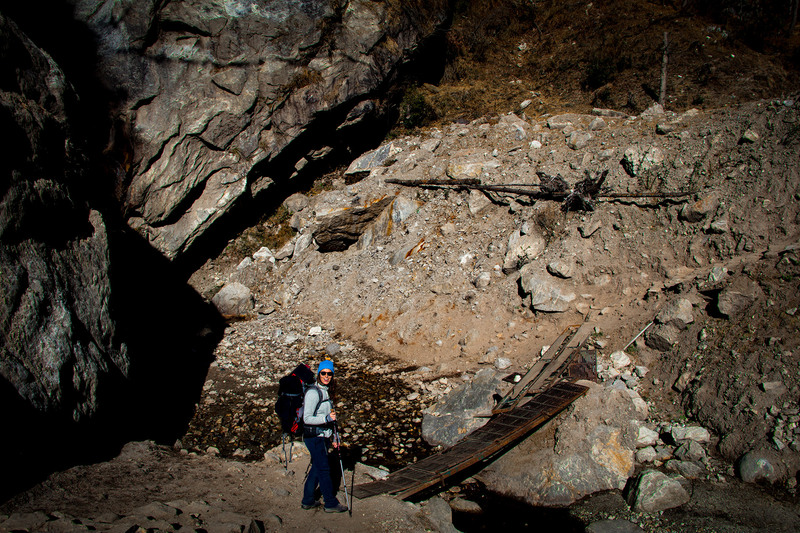 This bridge also marks the entrance into Sherpa land. The views from the bridge are simply stunning. An experience we will never forget. 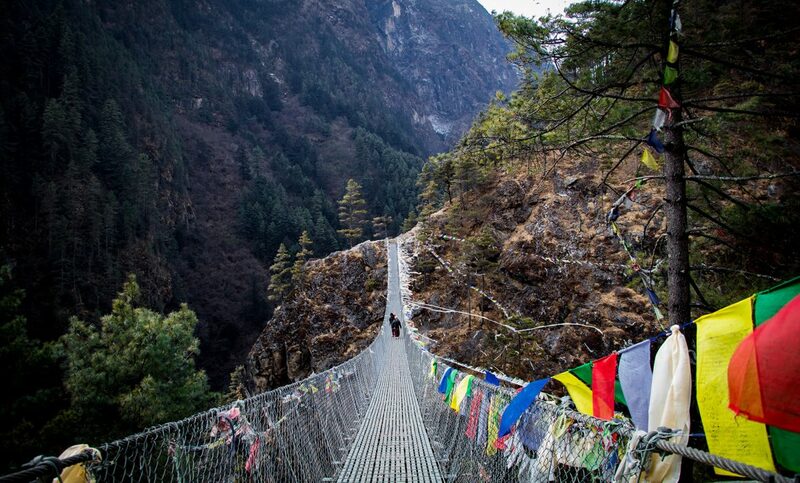 It was also the highest and scariest suspension bridge of the whole trek. From here it was about two hours straight uphill until we reached Namche Bazaar. We had the same speed than the donkeys who overtook us a few minutes ago. One donkey wasn’t feeling so well, every time they or we overtook, he was carrying less. First, they took off the gas bottle, then even the saddle. 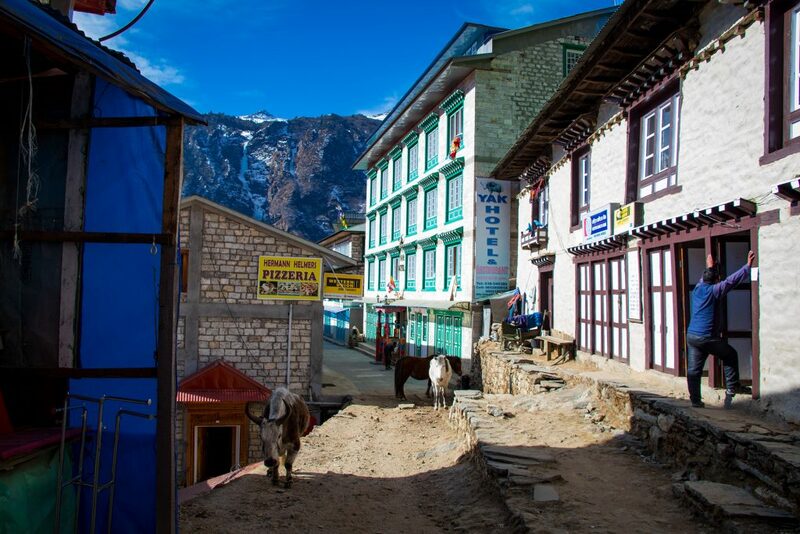 We are not sure if he made it all the way up to Namche, but his owners tried everything to get him there. He even fed him his pee. Our backpacks were feeling more massive than ever before. 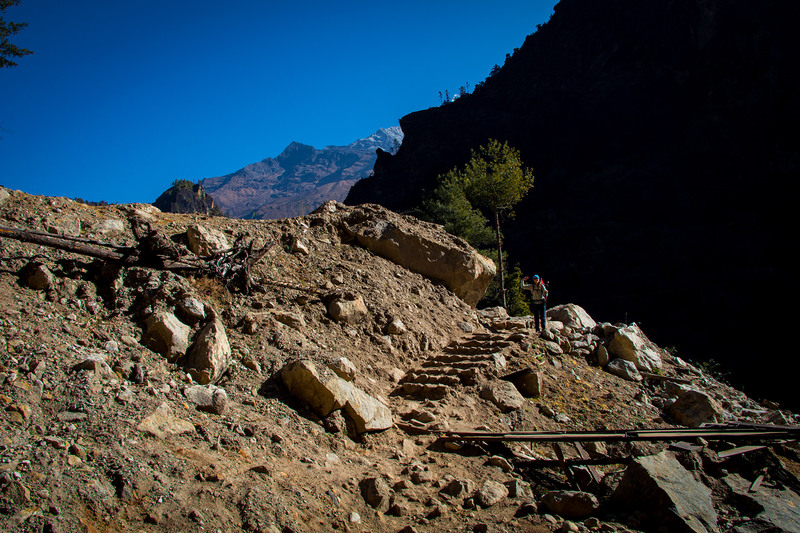 The trekkers walking down had a huge smile on their faces. I still remember one of them saying: »You will enjoy this day sooooo much» – and we would! But for us, it was just uphill. 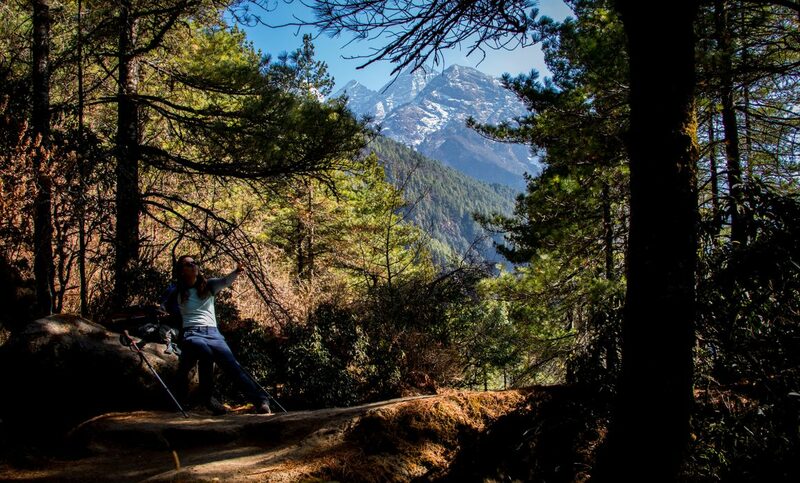 If you are lucky, you will spot the Everest for the first time. There is a small hut, from where you can already see the top of the world. A few meters before we reached Namche, there was another TIMS card check. 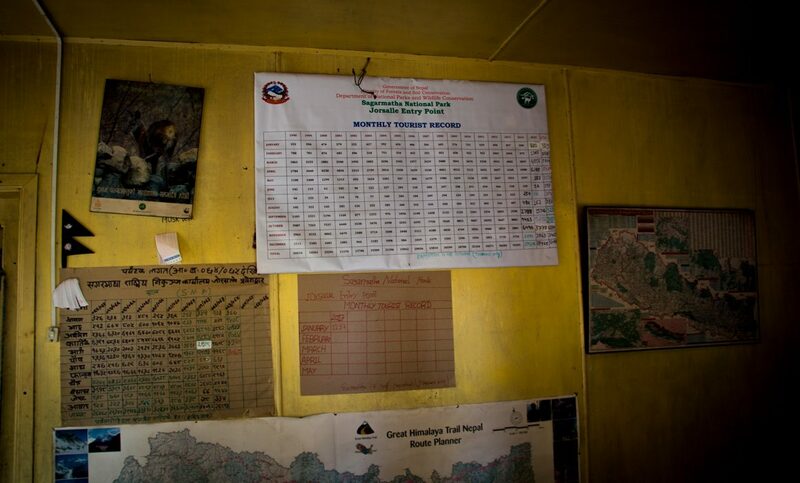 While waiting at the checkpoint, we were looking at a wall with people who went missing on the trek. Some of them just a few weeks prior, which made us feel somewhat queasy. 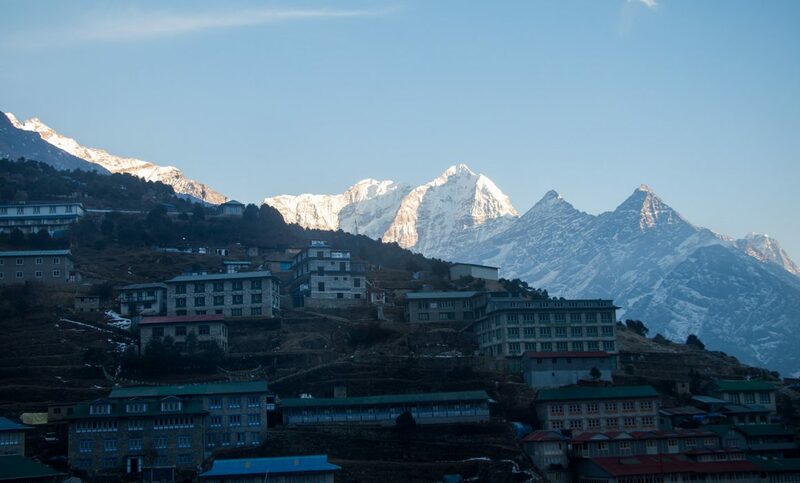 We finally reached Namche Bazaar – the biggest town in the whole region – when the sun already prepared to set. 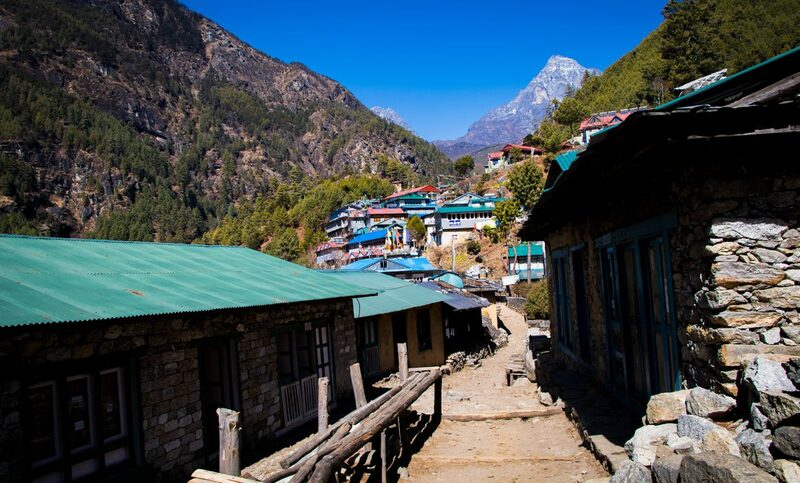 Namche offers many little stores, with locals selling a diverse range of items – from souvenirs to trekking gear to general groceries. There are also quite a few restaurants and coffee shops around. We checked into the Yak hotel & restaurant. Our home for the next two nights. It’s a simple hotel with everything you could want or need (including free electricity!) and of course stunning views over Namche. After a huge dinner, it was time to get some rest. What an amazing day….